The Romantic Wild West: Cowboys, Ranches…Ostriches? Today on the blog we’re featuring the brand new book by historical romance author Sara Luck! UNDER THE DESERT SKY features Sara’s trademark blend of passionate romance and incredibly accurate western history, but it also has something we bet you’ve never seen before: ostriches! But what about those ostriches? We know Sara Luck always does her research, but we couldn’t believe something so quirky could be really true. Guess what–it is! Take a look at some of these old pictures…now we know where all those amazing ladies’ hats got their plumes. This ostrich ranch is in Southern California, but just like in Luck’s book, they had to travel all the way from South Africa! People came from far and wide to visit Cawston’s Ostrich Ranch, which was kind of an ostrich theme park. Not only could you watch their feedings every day, you could drive a little ostrich-pulled cart, or even ride them, as these two ladies of leisure were doing. Arizona and California apparently had the climates most suited to ostrich ranching. If you find yourself in Arizona, you and your sweetie can play Phoebe and Christian at Rooster Cogburn’s Ostrich Ranch, and feed the “living dinosaurs.” (That doesn’t really make them any cuter, guys.) Just watch your fingers! Tell ’em Sara Luck sent ya! 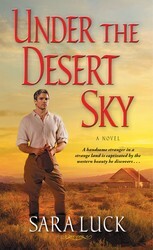 Sara Luck is known for her “well-developed characters, accurate historical settings, and hot naked men” (RT Book Reviews), and Under the Desert Sky does not disappoint! Fans will love this story of a widowed frontierswoman and the ranch hand who might be all that stands between her and ruin. I love historical westerns! Loved those hats! !